Guy One is revered in the small, remote communities of northern Ghana where he has spent his life as a singer at funerals and weddings. He's so popular, he tells tQ via email, that "some old men and women swear that if they die and I don't come to perform then they should not bury the deceased body." After years of building up a supreme local reputation, later leading to award-winning Ghanaian TV appearances, One's debut LP #1 will be released to the world on Friday (January 26), and we of tQ are streaming it exclusively below. The catalyst for his music's newfound expansion was a visit by Max Weissenfeldt of Philophon records, who has been travelling to and from Ghana since 2010 to explore the nation's music. Picking up one of One's CDs it didn't take long to track down the man himself. 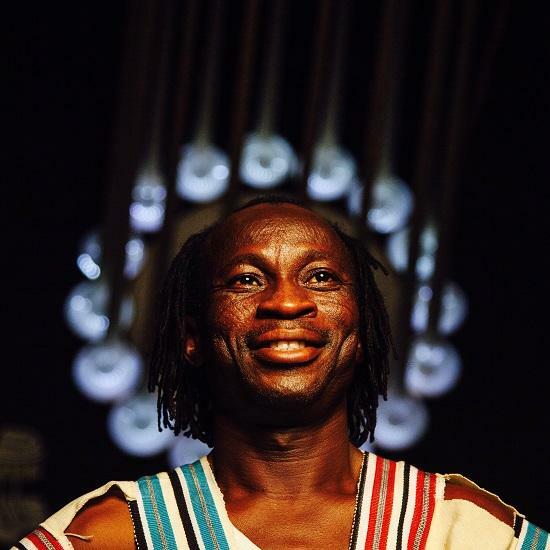 One's style of music is known as Frafra, a name also given to refer to the communities of northern Ghana and southern Burkina Faso from which he hails. "They are songs we sing to all people, but specifically the Frafra peoples, advice to help them live good lives and better themselves for the future," he describes it. Weissenfeldt invited him to Berlin to record over the course of a number of sessions, in which time One's music cross-pollinated with a German influence. "I have hopes for this album," says One. "I hope it will take me higher and higher, but Max is in control of that."